A different type of phyllo pastry that surprises pleasantly with its wonderful, rich and nutty flavor. Whole wheat flour can really make a difference. The recipe produces six large and thick pastry sheets, suitable for any creation. Watch the video to learn the rolling out technique and how to preserve the pastry sheets. In a large bowl put the two flours & salt. Mix well. Add the olive oil, the vinegar and gradually the water. Mix until the sides of your bowl are clean. Take the dough out onto your working bench and start kneading. Knead for about 15 to 20 min until you have a smooth dough. TIP: Cut the dough into pieces and rejoin them randomly to speed up the process. Put it in a bowl, sprinkle with flour and cover with a towel. Allow to rest for 30min. Weigh and cut the dough into 6 equal pieces. Shape them into smooth balls and cover with a towel. Put the first ball onto a well floured surface. Flatten it with your hand. 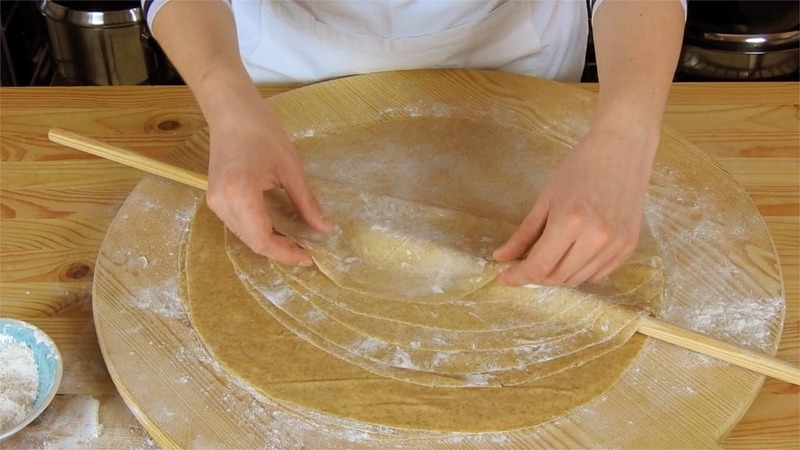 Using a thin rolling pin, roll back & front until the sheet gets about 20cm / 7.8” in diameter. Then wrap the sheet around the pin and press slightly with your fingers, moving your hands from the center towards the edges. Gradually the sheet will get bigger. Its final diameter should be about 45cm / 17.7”. When the sheet is ready, put it between two pieces of plastic wrap sprinkled with flour. Roll them all together into a large log. Store them in the refrigerator up to 4 days or in the freezer up to 6 months. Thaw them in the fridge overnight.